Was the letter to the Nation Newspaper too Critical? The original editorial in The Nation is included just below Dr. Foley’s letter to the editor. The following letter was submitted to letters to the editor of The Nation newspaper. The letter was not published. Is it possible the Nation’s editors like criticism flowing only one way? 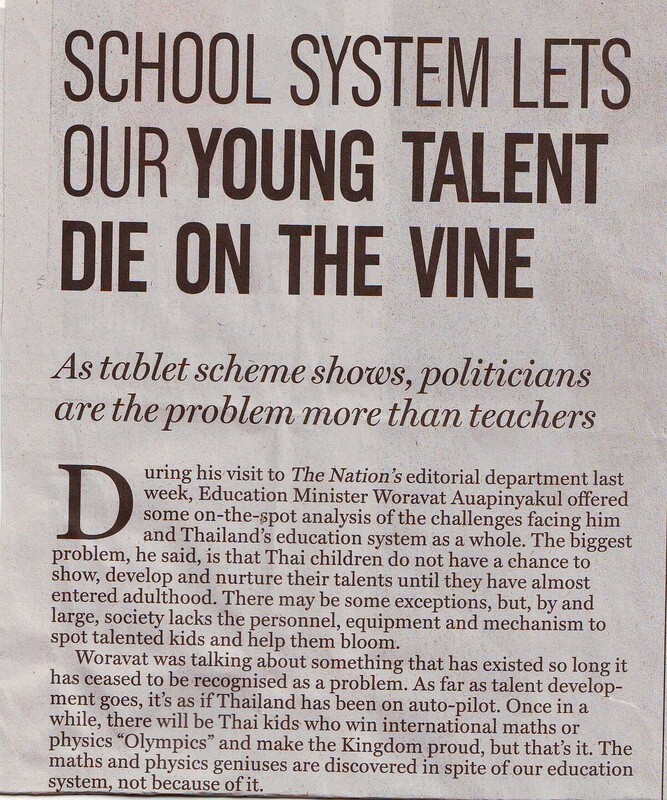 Reading your editorial in the Nation , the reader is compelled to ask: does the writer really care about Thai school children dying on the vine? There is no mention of the huge disparity in wealth and educational resources between Bangkok and the rest of the nation. 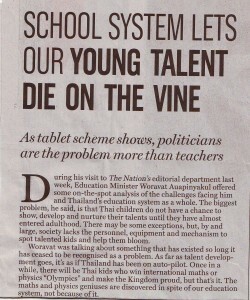 There is no mention that Thai students in the private and demonstration schools of Bangkok are not dying on the vine. There is no mention of positive steps that can be taken in order to make a more level playing field in terms of education and opportunity in Thailand. 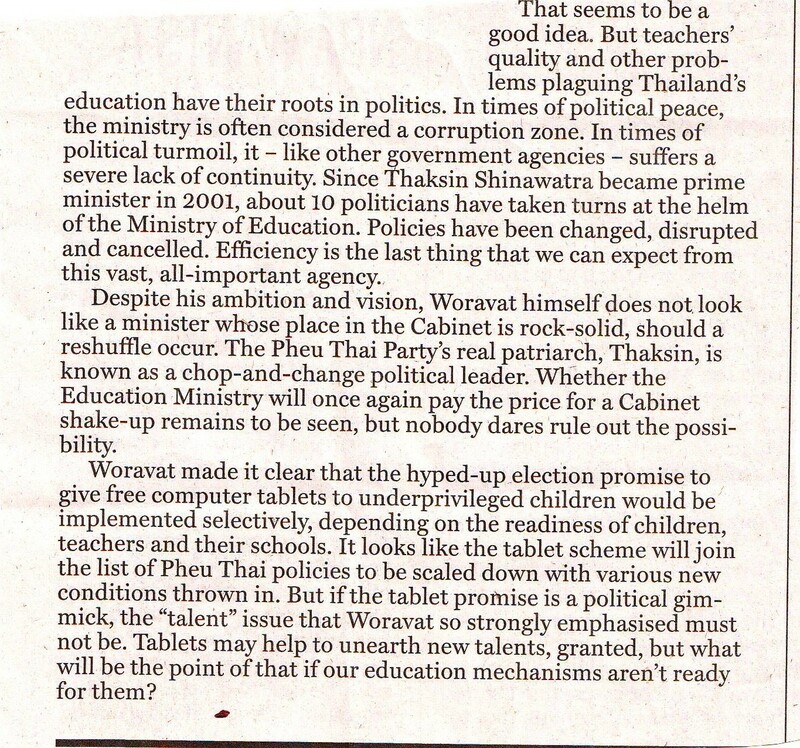 Instead, the editorial states that the quality of teachers and other problems have “their roots in politics.” At this point the editorial itself turns into a political diatribe, slyly mentioning that since Thaksin became prime minister in 2001 there has been a crippling discontinuity in education policy. Nowhere is there mention of the coup , mention of the Abhisit administration, or mention of the 1997 economic disaster that occurred during the Democratic Party watch. 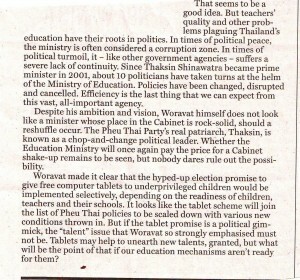 Education Minister Woravat Auapinyaul is damned with faint praise and we are told he may lose his job. 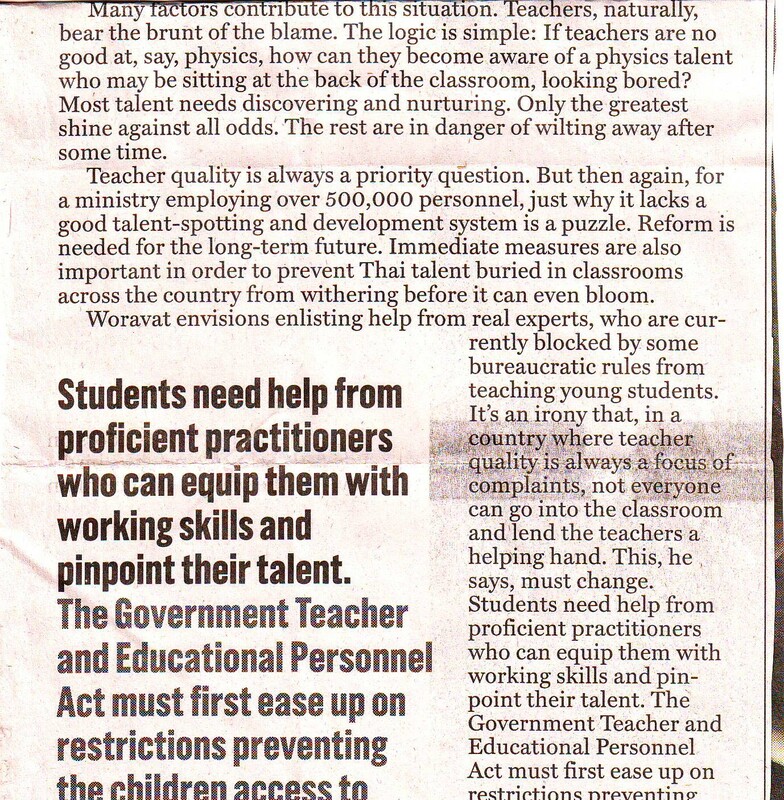 It appears disingenuous ,too, to write that the failure to spot and develop good talent in education is a puzzle.Thailand is harnessed with a rigid hierarchical system where seniority rules the roost. The Ministry of Education is no exception, nor are the local public schools. Therefore, youthful talent is often suppressed by superiors, not nurtured . This is a cultural obstruction, not a political one. The last straw for me was the mention of the tablet PC as a political gimmick. The tired old argument that the “educational mechanisms” aren’t ready for them is raised. Again , the editorial misses the real point. The children are ready for the tablet PC. This is the digital age. Thai children are ready. Thai youth are ready. Give them a chance. Please! The Thais have a better excuse, ‘tradition’ you are threatening the very roots of the political/industrial system. Two tiered education seems quite entrenched and attempts to change that are resisted by those who can afford to send their children to private schools. The resultant advantage entrenches the tradition even further. Thankyou for your efforts, I hope I live long enough to see some effect from your efforts. I welcome your constructive critism to the Thai educational system, which has similarity with many other countries’ education systems in the region. Considering the building of better world in future, no doubt that our generation needs to invest in students and young people. 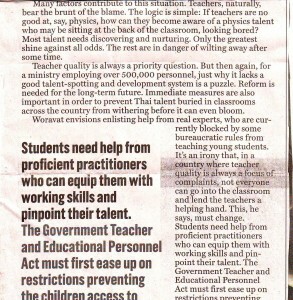 The education system should definitely be forward-looking, outcome-based and student-centred. I should say it is not a science, but an art. We need to make balance between tradition and advanced development. Educational plans should be prepared to equip students with sense of accountability and responsibility to become a good citizen and abide civic duties while creation of opportunity for better learning ground is the ‘must’ for them. Please keep it up and we support you.